Brothers Peter and Mark Saturno and Vineyard Manager Dino Cotsaris grow our Longview Vineyard Grüner Veltliner at Macclesfield, Adelaide Hills. Soil: Rocky and scattered with ironstone and quartz. Fine silt & sandy loam topsoil, dense clay and loam subsoil. 100% Adelaide Hills Grüner Veltliner, hand-picked in the cool of the morning. Gently whole-bunch pressed followed by wild fermentation on full solids. Fermented cool and slow in a stainless steel tank aiming to preserve the purity of vineyard & fruit flavours, followed by time on lees for mouthfeel. 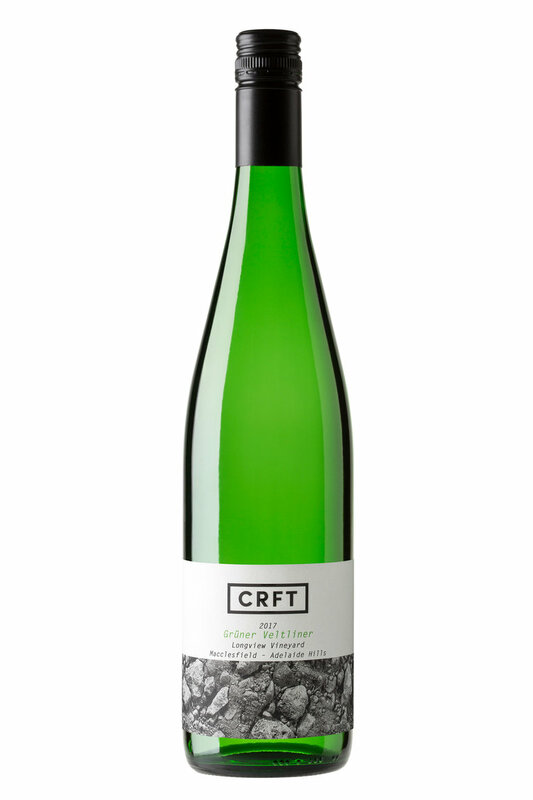 Unfined and crafted with minimal additives, all CRFT wines are vegan. Bottled on 4th July 2017, 146 dozen produced. Hand-made by Candice & Frewin at their Arranmore property in the Piccadilly Valley, Adelaide Hills. Intense with grapefruit, apple and citrus, hinting at pepper with warm anise spice; peach and nectarine stone fruit flavours in the background. Lovely fruit concentration and creamy mouthfeel, textural with mouth filling acidity, a classic mark of the 2017 vintage. Drinking: Ready to drink on release, will cellar for 10+ years. Brothers Peter and Mark Saturno and Vineyard Manager Dino Cotsaris grow our Longview Vineyard Grüner Veltliner. Soil: Rocky and packed with ironstone and quartz minerality. Dense clay and loam subsoil. 100% Adelaide Hills Grüner Veltliner. Hand-picked in the cool of the morning. Fermented cool and slow in a stainless steel tank to preserve the purity of vineyard and fruit, followed by time on lees for mouthfeel. Bottled on 15th June 2016, 155 dozen produced. Handmade by Candice Helbig & Frewin Ries in the Piccadilly Valley, Adelaide Hills. Zingy and alive; lemon, lime and white mulberries with sweet sliced green beans, freshly sliced vanilla bean and spice. The pallet explodes with a burst of acidity, Granny Smith apple fruit and textural crunch. Drinking: Ready to drink now or cellar for to 2030. The Longview Vineyard is owned and run by the Saturno family with Vineyard Manager Dino Cotsaris. Gently whole bunch pressed and fermented cool & slow in stainless steel to preserve the purity of the vineyard, followed by time on lees for mouthfeel. Crafted with minimal additives, all CRFT wines are vegan. Wonderfully expressive nose with freshly sliced granny smith apple, honeydew melon and fennel seed notes. Awesomely fresh with celery, cucumber and a squeeze of lime. The palate medium bodied with luscious layers and a cheek-filling textural edge. Drinking... Enjoy upon release or cellar to 2025.